Very nice location, perfect self-checkin, very detailed instructions before arrival, wide rooms. Apartment space and that you have what you want in it. Employees are nice, pleasant and service oriented. The location was excellent and the rooms were spacious. The apartment was big and in good location. Supermarket, resturant and a visit point was so close as well as aerobus station. We got our room at 9:30 with no extra charg. The apartment had a lot of space. It was clean and we'll supplied. Staff were nice and answered questions. Had a space to leave luggage too. Location is close to train station and metro. Felt comfortable in the neighborhood. Accessing these apartments from the cruise port was very simple by taxi. It's in a nice neighborhood in a great location - within walking distance of the Placa de Espanya (don't know if I spelled that correctly) where there's food, shopping, and lots of transportation including the hop-on-hop-off buses. We arrived early, but the reception folks were very nice, and we were able to put our bags in another room while we waited. The room was even ready an hour early. There is a small market just a couple doors down and a bunch of cafes. We had three adults and two kids - we were all perfectly comfortable! The location and variety of shops and stores close by. 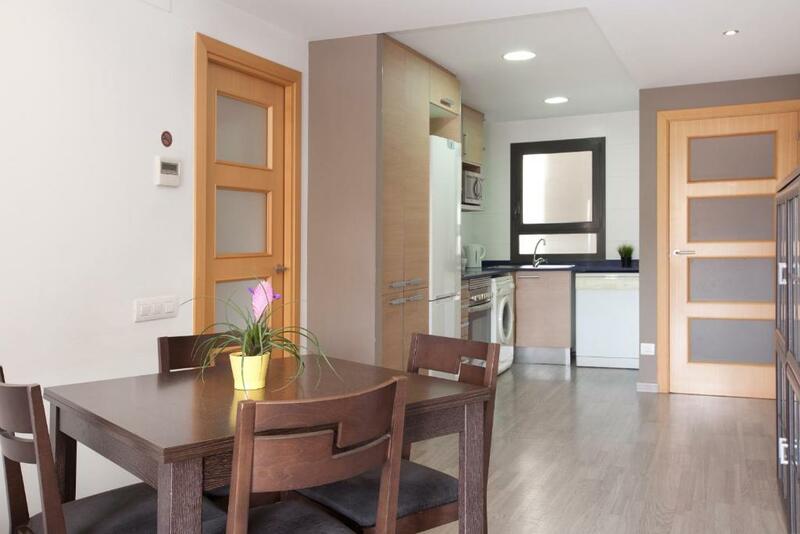 Lock in a great price for APBCN Eixample Fira – rated 8.4 by recent guests! One of our top picks in Barcelona.APBCN Eixample Fira is located next to Barcelona’s Joan Miró Park, 1,650 feet from Plaça Espanya. It offers apartments with free Wi-Fi and a flat-screen TV. The Fira Trade Fair, Montjuic and the Magic Fountain are all a 10-minute walk from Apartments Eixample Fira. Tarragona Metro Station is only 350 feet away, and Sants Train Station is 1,950 feet away. You can reach La Rambla and the Gothic Quarter in 10 minutes by Metro or bus. When would you like to stay at APBCN Eixample Fira? This room features 2 bedrooms and 4 single beds. It includes a bathroom, flat-screen TV, living-dining area and well-equipped kitchenette. It also has a terrace. Without a doubt, this is one of the most laid-back and comfortable areas in Barcelona: in the Eixample, 6 minutes from Plaza de España, one of the main key centers in Barcelona. My location and capacity make me a splendid choice for families as well as for business travelers. The conference and event centre Fira Barcelona is less than 10 minutes walking. Other attractive sites in my area are the Montjuïc with its Magic Fountain, the shopping mall Las Arenas, the Sants neighbourhood and the Paralelo. Las Ramblas are just 4 metro stations away. I have admirable connections: two minutes walking from the metro station (station Tarragona), and less than 10 minutes walking from the Sants train station and the airport bus Aerobus. House Rules APBCN Eixample Fira takes special requests – add in the next step! APBCN Eixample Fira accepts these cards and reserves the right to temporarily hold an amount prior to arrival. Please note that the terraces close at 22:00 in order not to disturb the neighbors' rest. Please inform APBCN Eixample Fira of your expected arrival time in advance. You can use the Special Requests box when booking, or contact the property directly using the contact details in your confirmation. The room next door was extremely loud and you could hear everything through the walls. The guest next door was screaming on the phone to someone for a long time. One night we were woken up at 3am with someone buzzing the apartment bell from the street, a drunk Ukrainian man. Friendly receptionist, spoke english and well informed. Thank you for the stay, everything was well organized, the hosts were very nice and helpful. Well located, clean, cozy and comfortable. It was a very pleasant stay, we would definitely come back! The apartment was not clean, it was dusty and appliances were old. There was no pan for cooking! The apartment was a little cold by night (in february) and we could't the heat on because of the noise it was made by it. Location was great with easy access to metro. A lot of markets nearby. Recommended for a short trip. Maybe a little to far to walk to city centre. Great location beside both the Metro, Barcelona Sans and Bull ring shopping. Condis supermarket very close and lots of restaurants.Apartment very clean and quiet and staff very friendly. Very pleased and would return. Very safe area. It was a very good system put in place to pick up the keys. The apartment was clean and inviting. Everything was good, the rooms were very clean, and the check in - check out system was the best what I have ever seen... Good job! Thanks.